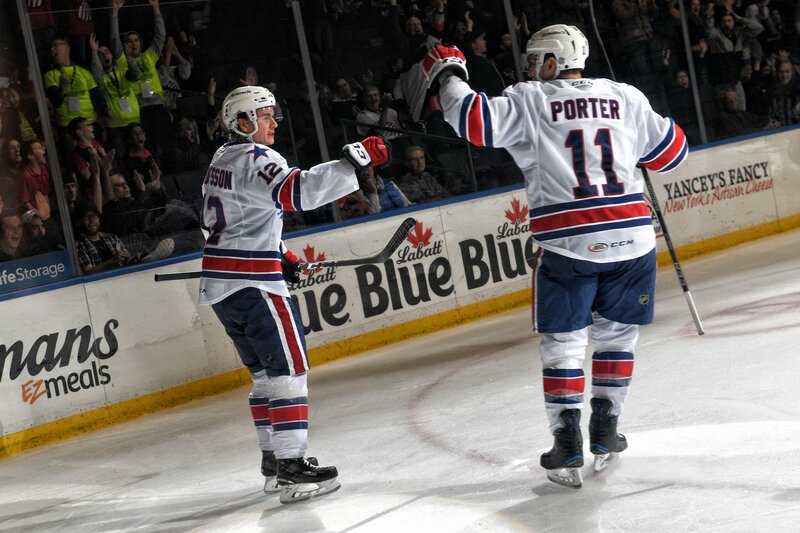 Poor First Period Ends the Amerks Point Streak · Let's Go Amerks! It only took five seconds for the game on Friday night to get off to a rough start and it didn’t get any better the rest of the first period. Hershey scored three in the first, Rochester didn’t score until the third period when it was too late and there’s your game summary. Kevin Porter won the opening face off back to defenseman Lawrence Pilut. Pilut immediately attempted a break out pass up the ice towards CJ Smith but the puck took a different path and went over the glass behind the Bears player bench. A two minute delay of game penalty was called on Zach Redmond. What? How? Redmond didn’t seem to put up much of an argument that he was called. The bad start goes back to before the game even started. CJ Smith said, “we have to come in and get our mindset a little more focused before the game starts.” He also emphasized it’s not just getting to the rink but it’s the hours and days leading up to a game. Hershey forward Mike Sgarbossa scored 57 seconds into the first period redirecting a shot from the point. With 2:16 left in the first period Hershey scored again off a face off to go up 2-0. Chris Taylor wasn’t happy with how the play unfolded. He said, “I thought both guys got pushed to the sides and didn’t push through it enough to help out.” He’s referring to Alex Nylander and Lawrence Pilut. There’s two forwards and a defenseman on the side who are expected to prevent shots like that. Less than two minutes later Axel Jonsson-Fjallby put the Bears up 3-0 and it was the game winning goal. Cleared the zone, entered the Amerks zone, dangled Borgen and put the puck past Wedgewood. As the first period was nearing an end things got chippy and some big fists were thrown. Dalton Smith unloaded a barrage of rights on Liam O’Brien as Yannick Veilleux exchanged punches with Connor Hobbs. Both Veilleux and Hobbs were handed game misconducts for a secondary altercation. That added energy brought some life to over 6,000 people in the building and once the second period started the Rochester Americans started playing hockey again. Adam Wilcox replaced Scott Wedgewood at the start of the second period. There wasn’t any scoring in the second but it was a start. Rochester had more shots, more chances and Dalton Smith continued to hit everyone he could on the ice. CJ Smith scored his fifth goal of the season finding an unlikely corner with ease, assists to Lawrence Pilut and Danny O’Regan. Victor Olofsson ended his four game drought without a goal scoring with 2:42 left in the third period and giving the Amerks hope of tying it up. Rochester put pressure on Hershey in the final minute of the game but it wasn’t enough, an empty net goal with six seconds left gave Hershey a 4-2 win. Rochester got off to a bad start, Hershey played to protect the lead. Both teams departed immediately following the game to drive to Hershey for a rematch on Saturday night. Rochester plans to get off to a better start and Hershey will be looking to extend their winning streak to four games. CJ Smith had a team high seven shots in the game and was the best forward throughout the game. Constantly challenging for pucks, shooting pucks and finally scoring in the third period. CJ Smith now has two goals in two games, five for the season, after a five game stretch without scoring. Last season he had a seven game drought, nine game drought and a ten game drought without scoring. When he’s on, he’s on and is a factor in games. Alex Nylander appeared back to old ways on Friday night. His overall play has been better this season but after missing an assignment on the first goal and not having a shot on net he was essentially benched in the third period. He had two shifts totaling less than a minute of ice time with his second shift ending with 15:27 remaining in the third period. There didn’t appear to be anyone else benched in the third period. The highly talked about power play has suddenly hit a rut. This was the second game in a row that the special teams has been held without a goal. It seems like teams have done their homework to prevent Redmond, Pilut and Olofsson from freely moving the puck around. Rochester was without Kyle Criscuolo for the second game in a row as he nurses a lower body injury. It’d be easy to say the team missed him on the ice but that’s not an excuse when no one else showed up to play the first 18 minutes of the game.